This study focused on the transnational practices of Tongan migrants' adult children, particularly their contributions of remittances to family and institutions in Tonga. Drawing on qualitative and quantitative data gathered in Tonga and six locations in Australia the project showed that the second generation are remitting at far lower levels than their parents' generation, despite many of them maintaining other forms of transnational connections. This project was funded by the Australian Research Council, DP0557299, 2005-2007 ($179,000). Lee, H. (2011) 'Rethinking transnationalism through the second generation', The Australian Journal of Anthropology, 22 (3). Lee, H. and S. Francis, eds. (2009) Migration and transnationalism: Pacific perspectives. Canberra: ANU E Press. Lee, H. (2009) 'Pacific migration and transnationalism: Historical perspectives' in H. Lee and S. Francis (eds) Migration and transnationalism: Pacific perspectives, pp.7-42. Canberra: ANU E-Press. Lee, H. (2009) 'The ambivalence of return: second generation Tonga returnees' in D. Conway and R. Potter, (eds) Return migration of the next generations: Transnational mobility in the twenty-first century, pp.41-58. Aldershot: Ashgate. Lee, H., ed. (2008) Ties to the homeland: Second generation transnationalism in Australia. Newcastle Upon Tyne: Cambridge Scholars Publishing. Lee, H. (2008) 'Second generation transnationalism' in Helen Lee (ed) Ties to the homeland: second generation transnationalism, pp.1-32. Newcastle: Cambridge Scholars Publishers. Lee, H. (2007) Transforming transnationalism: second generation Tongans overseas', Asian and Pacific Migration Journal, 16(2): 157-178. Lee, H. (2007) 'Generational change: the children of Tongan migrants and their ties to the homeland' in E. Wood-Ellem, (ed) Tonga and the Tongans: Heritage and identity, pp203-217. Melbourne: Tonga Research Association. Lee, H. (2006) '"Tonga only wants our money": the children of Tongan migrants' in S. Firth, (ed) Globalisation, governance and the Pacific Islands, pp.121-136. Canberra: ANU E-Press. Lee, H. (2006) 'Debating language and identity online: Tongans on the net' in K. Landzelius, (ed) Native on the net: indigenous and diasporic peoples in the virtual age, pp.257-281. London: Routledge. 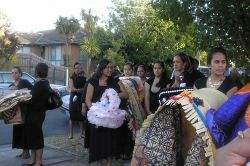 Image: Second generation Tongans at a funeral in Melbourne with traditional wealth items. Photo courtesy of Meliame Fifita.